A systematic way to enforce community Ebola procedures has been missing in Sierra Leone’s Ebola outbreak, enabling the disease to spread around the country. 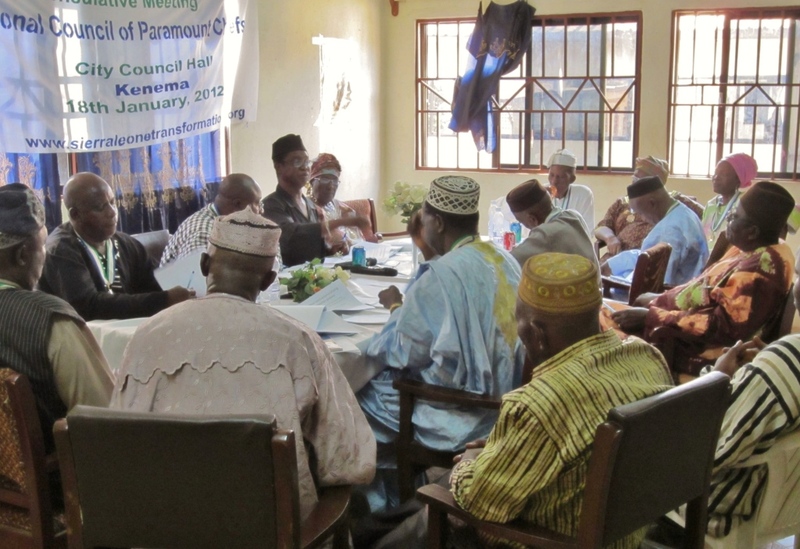 Paramount Chiefs are now authorized by the Sierra Leone government to do this. The National Council of Paramount Chiefs developed a national template for individual chiefdom byelaws on managing Ebola at the community level. The “Byelaws on the Prevention of Ebola and other Diseases” were approved by the Honorable Minister of Local Government and Rural Development and made pursuant to the Public Health Emergency declared by the President of the Republic of Sierra Leone and approved by Parliament on Friday 8th August 2014 under section 29 of the Constitution of Sierra Leone Act No. 6 of 1991. Paramount Chiefs are now expected to adopt these byelaws into their chiefdom byelaws and enforce the provisions. Beyond imposing fines, chiefdom authorities have the right to pursue legal action in the Local Courts or courts of higher jurisdiction, for flagrant violations of these byelaws. The Sierra Leone Government had identified many community practices and procedures necessary to stop the spread of Ebola. But they did not have the ability to uniformly enforce them in all corners of the country, especially once you leave the few provincial cities. Paramount chiefs are a long standing country institution that ensures basic law and order, management of local land rights and maintaining traditional practices. There are 149 chiefdoms that cover every part of the country, with cascading chiefdom authorities down to the village level. But they are an institution separate from the Sierra Leone Government, and were not directly authorized to enforce Ebola practices established by the government. P.C. Charles Caulker, chair of the National Council of Paramount Chiefs, worked with the NCPC to harmonize byelaws some chiefdoms had started initiating on Ebola. They worked with the Honorable Minister of Local Government and Rural Development to finalize a national document , have it accepted by the Government Cabinet, and then approved by Parliament on August 8. Paramount chiefs are now expected to introduce and enforce these provisions as chiefdom byelaws. They include nineteen provisions and authorize chiefs to impose fines of up to Five Hundred Thousand Leones (Le.500, 000) and/or a term of Six (6) months imprisonment for any breach of these provisions. The provisions include Communication of Ebola, where no one can harbor a person suspected of having contracted Ebola and all strangers arriving in any residential area shall be immediately reported by their host, guest house or hotel to the competent chiefdom authorities. They continue to Treatment of Ebola where only personnel part of recognized facilities for the treatment of these diseases can be involved in treatment of any Ebola patient. Provisions for quarantine and receiving recovered Ebola patients back into their communities are given. Provisions for Death and Burial are defined. Miscellaneous provisions temporarily prohibit public gatherings, including Luma markets and Secret Society activities, and the hunting and selling bush meat. Public places, including those of worship, are encouraged to have hand washing buckets with chlorinated water. Any chief, including paramount chiefs, found negligent in the application and enforcement of the Bye-laws is liable to a fine of Five Hundred Thousand Leones (Le.500,000) and / or summary suspension from office. Directly engaging paramount chiefs and authorizing them to enforce community Ebola practices will go a long way to controlling the current outbreak. This hopefully also represents a new level of working relationship between the government and the country’s traditional leaders. 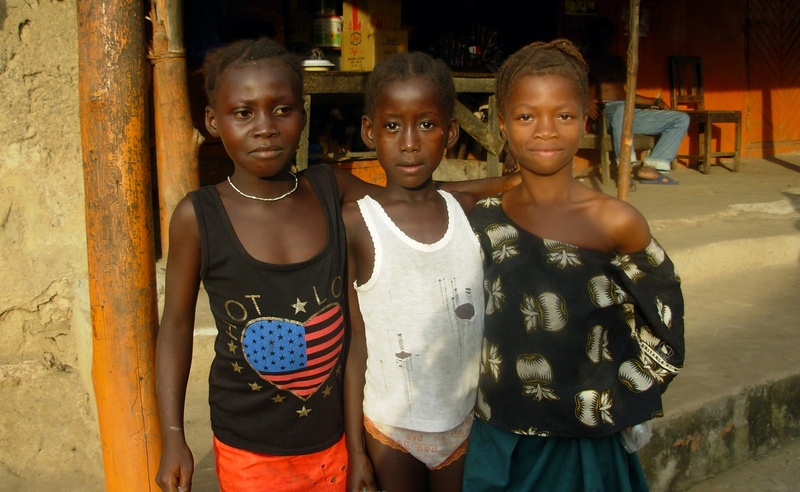 Global T was kind enough to Like the post “Growing a Baby’s Future in Sierra Leone.” So I went to visit their blog, The Traveling Winter Hat, and found it delightful. Too clever to try to describe here; visit it yourself. Thought I’d re blog their Thought for the Day. Sherbro Foundation came about in part because I didn’t want to only read a page of the world’s book at this point in my life. I needed to get back to my Peace Corps past when first coming to Sierra Leone so long ago and life truly was an adventure. Makes me also think of a recent Peace Corps recruiting ad: “Life is calling. How far will you go.” You don’t have to go as far as Sierra Leone. Just go, whether by foot or in your mind. So Global T, I don’t see Sierra Leone on your Traveling Winter Hat map yet. You’re missing a lot. Many organizations and businesses are promoting today as the second annual Giving Tuesday. We have a day to give thanks. Then we have two days to shop til we drop – Black Friday and Cyber Monday. Why not treat today as a day to give back – to celebrate the American tradition of volunteerism and charitable giving. Doing something for others has been shown to make you feel good yourself. It gets those endorphins humming along. Instead of feeling stressed about the busyness of the holidays and holiday shopping, make yourself feel good – and make a difference in someone else’s life at the same time. Give something to someone who needs it for the sheer pleasure of giving. Here’s a test for you. Can you even remember what you got for Christmas or Hanukkha last year? Or what you gave someone else? I have to confess, I can’t on either count. I have what I need, and I don’t need more stuff. I have been trying to convince family and friends that they will make me most happy by giving me the pleasure of giving to someone else. Don’t buy me a thing; buy me the experience of making a difference in someone else’s life. Actually, I have been doing this in forming Sherbro Foundation and giving my time and money to help develop Bumpeh Chiefdom in rural Sierra Leone. It has made me feel good – very good. So, I’d like to give you the same opportunity to feel good. First, why give to Sherbro Foundation? Make a Difference: Helping people living on $2/day or less move beyond poverty makes a huge difference. The Girl Effect: Investing in girls – and women – gives one of the biggest returns on investment of charitable dollars you can get. Strong Partnership: We work closely with one community to understand their needs & priorities and collaborate directly on delivering projects. Efficient: 100% of donations go to projects in the field; administrative costs are paid separately. 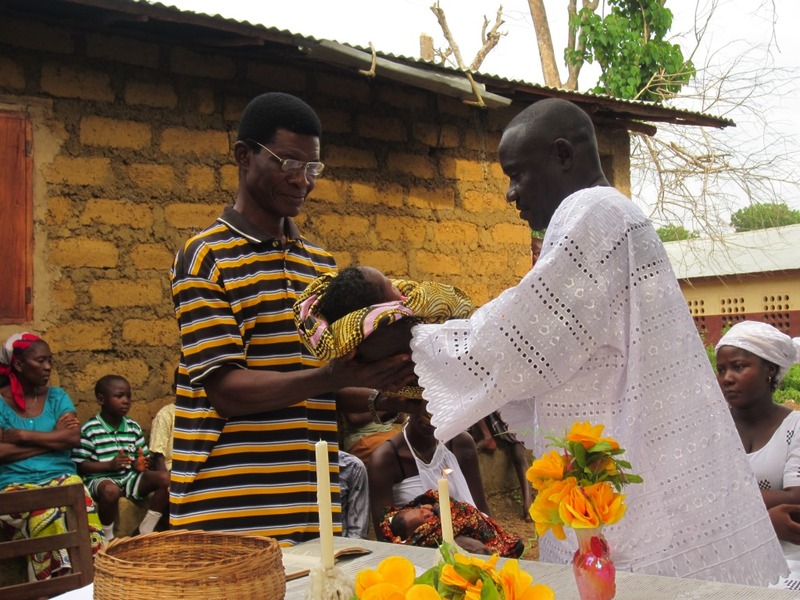 Father hands newborn baby to the pastor for blessing at Naming Ceremony. Thanks! I wish you a joyful holiday season and a very happy new year. I’m back from a month in Sierra Leone with lots of news to share. My main purpose in going was to be part of a meeting to publicly launch the Center for Community Empowerment & Transformation in Rotifunk. Gov’t officials, journalists and chiefdom leaders were all impressed with CCET programs to reduce poverty through education and economic empowerment with village tree planting. 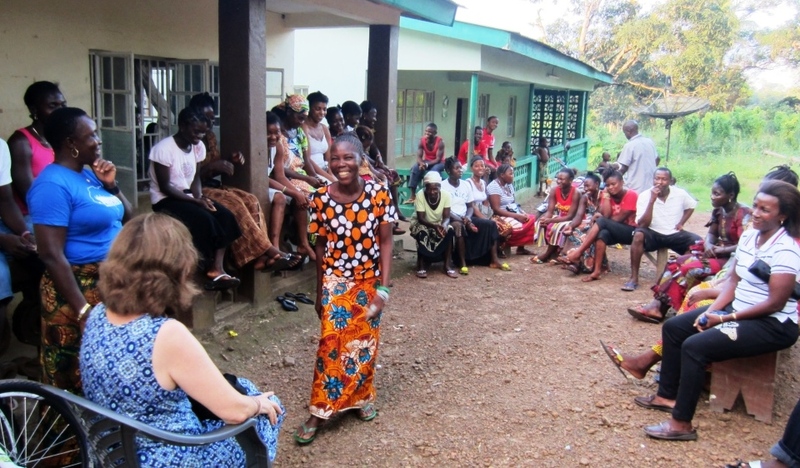 These programs were described as unique in Sierra Leone in being totally grassroots conceived and led. They do not come from Gov’t or NGO initiatives. I was honored to give the keynote address, representing Sherbro Foundation and our role as a partner organization. Adult Literacy students greet Arlene and thank Sherbro Foundation for the chance to start their education. I see and learn new things on each trip to Sierra Leone. This one was full of experiences for me. I witnessed newborn baby naming ceremonies and a traditional wedding, saw the rice harvest at one of the ten biggest rice farms in the country, and learned a lot about the role of paramount chiefs in contemporary Sierra Leone. I got project status updates, interviewed 37 new adult literacy students on their lives and hopes for the future, met families of girl scholarship students, watched the tree nursery grow to 8000 seedlings and work in progress to annually double that by planting season, and saw the computer lab running and adults taking their very first computer lessons so they can train others. So, stay tuned to this blog at www.sherbrofoundation and Sherbro Foundation’s Facebook page to hear more. The amount of work done in the last eight months is impressive. You can see what’s possible with your donations and support. It takes so little to make a very big difference in people’s lives in this small rural community in Sierra Leone.